Dave's Ravings: Happy Valentine's Day! Well it is that time of year when we show our appreciation to those we share our love with. I am blessed to have a lovely wife Denise, and a beautiful son, Jack. My love and admiration for her grows more every day. And I couldn't love my son anymore than I do already. He is quite the little character, and so full of joy and life! I hope everyone reading this has had a wonderful Valentine's Day with the ones they love. I ran across a couple of websites I 'd like to turn you onto if you are into CGI (that's computer generated imagery, or in this case computer animation). I just found these cruising around film makers websites. So check them out, especially the free downloads! 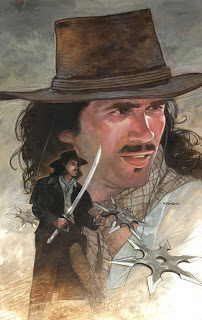 Now for me and my art, here is a more recent cover for the Highlander comics. Another western themed/ character piece. Very happy with the likeness in this one. Done in mixed media, oil, acyrlic, marker, colored pencil, (LOL whatever it takes to get it finished!) on gessoed illustration board. Looks Great Dave, love the lighting! I love Valentine's Day, but I think that the history of Valentine's Day is a bit sad... And nevertheless it's a great day when you can show your love and romance!